Emerged from a frass-covered cocoon in a mine in a shagbark hickory leaf (the one pictured on p. 347 of (1), which should make this P. caryaealbella or P. olivaeformis. Looks pretty similar to the latter, but I haven't found an image of the former to compare. The mine was collected on 9/23/2008; the moth probably emerged the following spring (all I know is I photographed it on 5/1/2010). 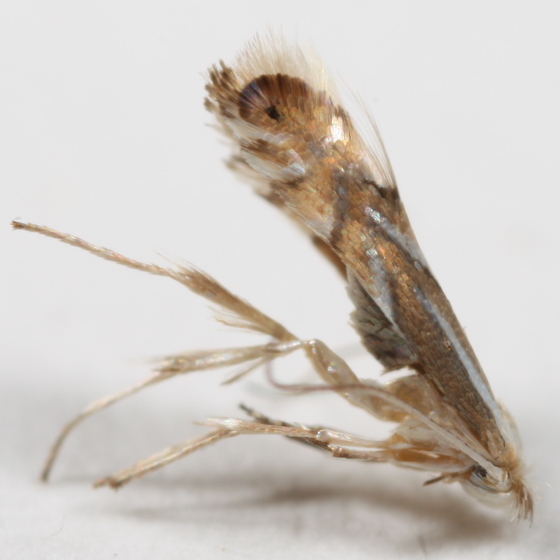 Of our two eastern-USA hickory-feeding Phyllonorycter species, this is P. olivaeformis. In P. caryaealbella the basal part of the forewing is white, whereas in P. olivaeformis the basal part of the forewing is concolorous with the rest of the wing and contains a central white line, as seen here (this info comes from Braun's 1908 "Lithocolletis" revision in the Transactions of the American Entomological Society).